Plate: 6" x 9.75", Framed: 14" x 18"
Plate: 5.5" x 9.75", Framed: 14" x 18"
Plate: 9.5" x 6", Framed: 18" x 14"
Plate: 7" x 4", Framed: 18" x 14"
​Bertha Evelyn Jaques, poet, printmaker, and curator, was born Bertha Evelyn Clausen in Covington, Ohio on October 24, 1863. The details of her early education are unknown but her family must have encouraged her independence and her curiosity. She met William K. Jaques in 1883 and they were married on Thanksgiving Day, 1889. 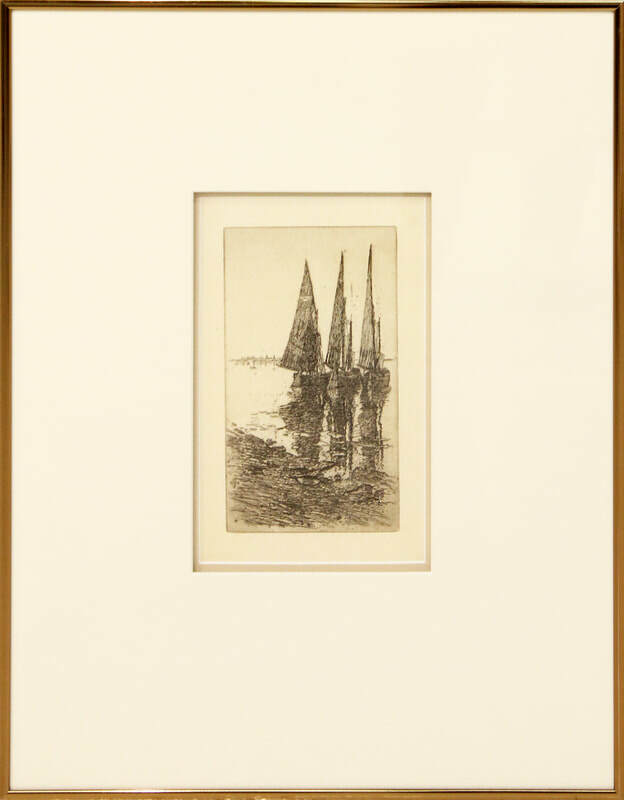 Jaques' importance to the history of American printmaking cannot be overstated. 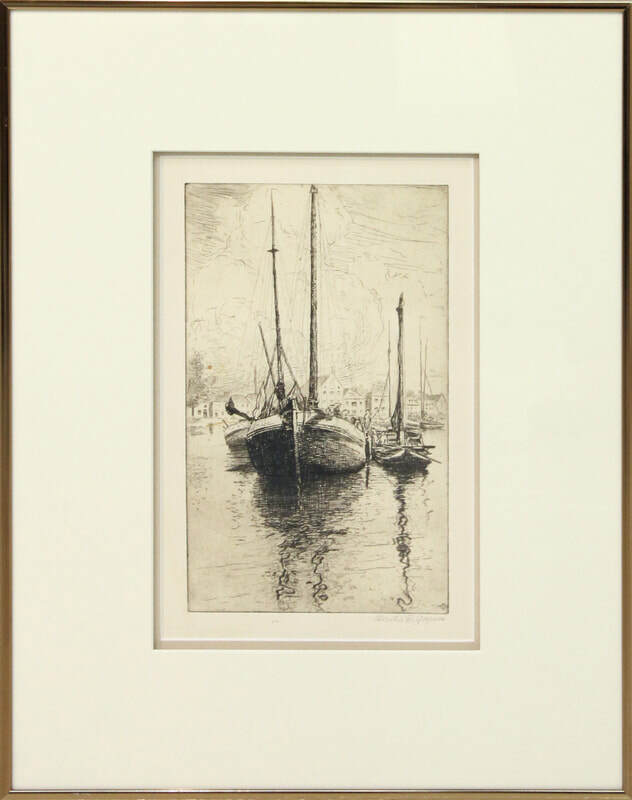 She was primarily self-taught as an artist and etcher and began experimenting with the process after viewing an exhibit of Whistler's etchings at the Columbian World's Fair in 1893. She convinced the director of the Art Institute of Chicago, William M. R. French, that the technique of etching could be used creatively, and with the assistance of others, persuaded him to install an etching press in the basement of the institute. In 1909, she shared her ideas for the basis of a "needle" club with Ralph M. Pearson, Earl H. Reed, and Otto J. Schneider and the following year the Chicago Society of Etchers was launched with an exhibition held in April in the basement of the Art Institute of Chicago. She was tireless in her promotion of the art of etching and helped to organize the society's yearly exhibitions until she was forced to retire in 1931. She instructed other artists how to make etchings and, on occasion, she printed their plates. Besides etching, she was interested in flowers and was an active member of the Wild Flower Preservation Society. She made cyanotype photograms of wildflowers by placing the flowers directly on sensitized paper and exposing the paper to light. Jaques' work is represented in the collections of the Art Institute of Chicago, the Johnson Museum of Art at Cornell University, the Library of Congress, the Mead Art Museum at Amherst College, the Portland Art Museum, and the Smithsonian American Art Museum. The Cedar Rapids Museum of Art has the most important collection of her work with over 400 pieces and the museum mounted a year long retrospective of her work in 2013. Bertha E. Jaques died at the age of seventy-seven in Chicago on March 30, 1941.